Lately I am more proactive when it comes to my body and skin because reaching 30 years old is like an alarming wake up call for me. I started by enrolling to a gym to work out regularly to lose weight and I am now obsessed in maintaining my youthful look. That is why I am always open to try out any new treatments or technologies available in the market as much as I could. 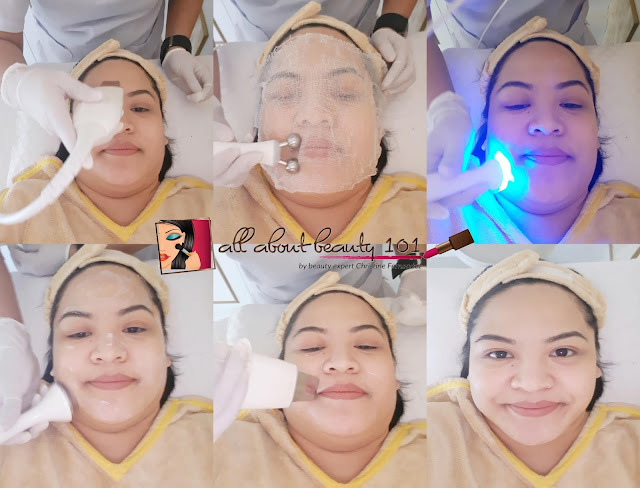 One of the skin care clinics that caught my interest is Luminisce Skin Clinic as I see some celebrities (like Carmina Villaroel) as well as famous influencers (like Anna Cay, Janina Vela, and Wil Dasovich) avail treatments from them. Luminisce is located at Mercury Drug Building in Bonifacio Global City (BGC). The skin center primarily aims to provide wellness, beauty, and body care through premium and innovative skin care services to cater client's physical fitness and psychosocial well-being. There are two branches available, one located at the Podium while the branch that I visited is located in BGC. It is quite far from where I live that is why I asked my boyfriend to give me a ride. (I am so thankful that he is supportive in what I love to do even though it is a long drive from home.) Hopefully they will open a new branch here in Quezon City. My skin was initially assessed by the doctors and I was presented with what my skin needs. They were able to assess that my skin is a little dry and that there are some pimples forming. I was advised to try out their Luxury Facial as well as the Coquille Peel first. With various of services being offered in their clinic it is hard to choose on what I wanted to prioritize but I wanted to include something that can help lift and tighten the skin of my face, I was interested most in trying out their newest Exilis Elite Treatment. I also wanted to try the Maximus - it is designed to contour and target the fats in both of my arms. Though contouring will not be appreciated in just one treatment to my flabby arms. 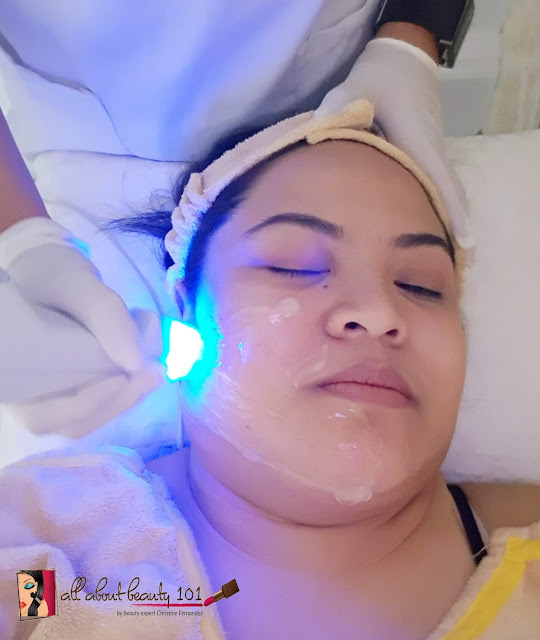 The four treatments that I chose will be started with Luxury Facial first, followed by Exilis Elite and Maximus then the last would be Coquille Peel. So, are you ready to read about my experience? Read more about it below. I came to the clinic in full makeup but the aesthetician happily offered to remove my makeup as well as to cleanse my face as part of the facial. The Luxury Facial includes the use of a special machine to assist the step by step process of the facial. After my face was thoroughly cleansed and massaged, I felt even more relaxed after I smelled a scent that is like Lavender or Eucalyptus. The first step includes extraction of superficial black and white heads using the machine. It feels like a vacuum but I enjoyed the feeling. Second step includes facial massage using a machine with a steel-like roller. The roller feels cool and refreshing to the skin. 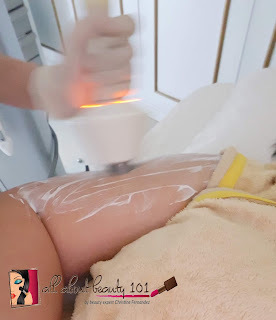 The third step, they were using a serum in my skin and with the help of the UV light, the aesthetician told me that it will help with the absorption. My favorite part of the Luxury Facial is the fourth step. The application of cream (moisturizer) with a cool, round and flat like metal that goes in circular motion in my face. It is my favorite because I felt relaxed with its massage-like motions. The next step is the removal of the cream with a spatula included in the machine. After that, there is a process wherein my face was exposed to mist air that contains skin care products. The last step is the application of facial mask. I think this procedure lasted for 45 to 60 minutes. I was not able to time it accurately because I wanted to enjoy the facial. In the end pf the Luxury Facial, my skin is brighter, softer, hydrated and most of all, smoother! Check out my photo after the treatment in the collage above. 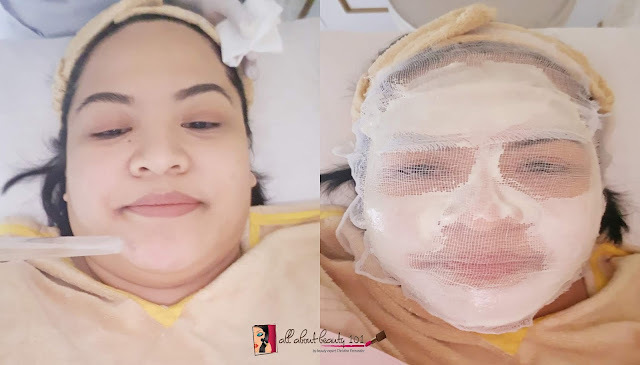 The Luxury Facial costs around 4,000php. I always dreamed about trying a procedure for my body because I usually have it done on my face. This is my first time to try a contouring for the arms. This procedure was done while my face was under the facial mask. So that the time would be efficient. A cream was applied so the machine could do its job smoothly. Since it was my first time, I did not know what to expect but the aesthetician explained the process to me. I felt an electric current from the machine as well as a deep pressure. It was explained that you will feel like you just did a long routine of workout of your arms but in reality, it was just a few minutes of your time and I agree because I was able to feel the soreness of my arms before I got home. I am glad though because I was not able to visit the gym during this day, feeling the soreness in my muscles gives me a feeling of satisfaction that I still did a workout routine for the day. Maximus Treatment costs around 4,000php for both arms. After the mask, I was prepped for the Exilis Elite Treatment. Primarily, Exilis Elite was designed for skin lifting and tightening that is not invasive. This is the latest technology offered at Luminisce Skin Clinic. What I love about this procedure is that, there is no downtime and can be done under an hour. 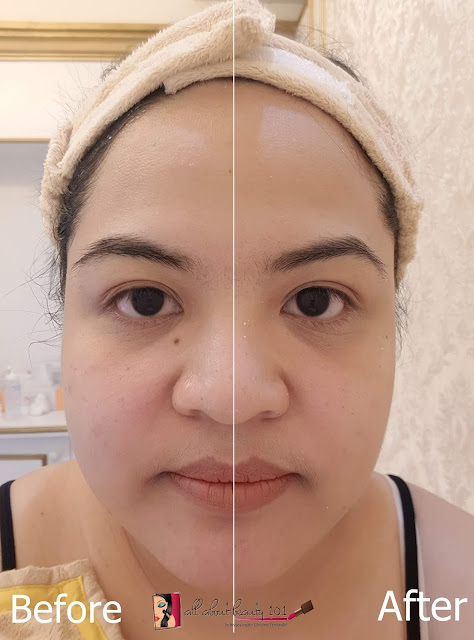 Besides the lifting and tightening, it also targets toning of any troubled areas in our face or it can also be done in other parts of our body. It can remove stubborn fat around the cheek area and achieve a slimmer, contoured face after a series of continued treatments. Exilis Elite uses radio frequency energy that heats up the skin, causing fat cells to shrink and be permanently removed from the problem area. The removed fats will naturally leave the body through the lymphatic system. Even though the treatment can be appreciated as early as two weeks after the first session, I already saw an improvement after my very first session. Check out my photo of before and after below. As you can see, my cheeks got smaller and it was lifted after the first session. So imagine if you will do it once a week or every two weeks, you can reach the optimum results! If I will continue doing this, I know that eventually I will be achieving a slimmer and contoured face! Exilist Elite procedure is around 12,000php for my face. Price may vary depending on the target area. Coquille peel is for treatment of acne and prevention of breakouts. It is included in the Luxury Facial but it was done as last on my whole day pampering. A gel like substance was applied on my skin and also removed. I felt a little itch and sting while my skin was soaked with the gel. This is my first time to have a whole day treatment just for myself, I spent more than 4 hours at the clinic and I was able to sleep lightly during the treatments. Stepping out of the treatment room is like stepping out like I just got back from a vacation - that is how it feels like for me - relaxing and rejuvenating. The treatments are unique and effective. The staff are accommodating and knowledgeable. 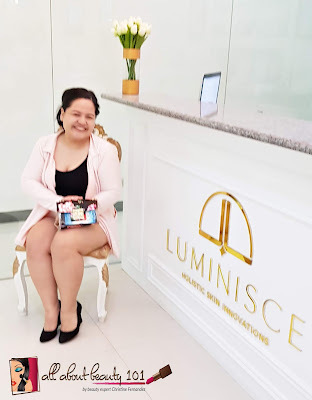 I will definitely come back to visit Luminisce if I can, I just wish that they will have a closer branch here in Quezon City so that it is more accessible for me. Interested to try out the treatments that I just did? 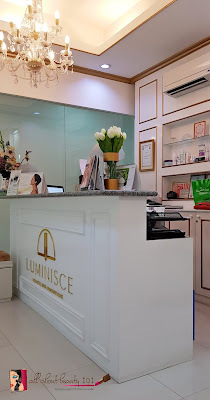 Book your appointment at 02-5118500 and you can visit their website at http://luminisce.com/ and like their page on Facebook at https://www.facebook.com/luminisce/. They also have an Instagram account that you could like, @luminisce_official.